What do those Olympians jam to when they're training and competing? Find out some of the top hits courtesy of the Fit-Bottomed Girls. Yikes to the women's GS race that partially went down today. I feel for Julia Mancuso--check out one of the reports at nbcolympics.com. Hooray for the medal winners from the U.S. 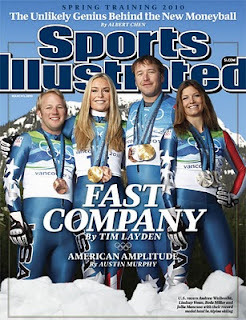 Ski Team for making the cover of Sports Illustrated. I became a fan of the Nordic Combined team Tuesday night when they won silver. What an exciting race and I can totally see why Johnny Spillane would call it a fun sport to watch and not just because he races it. Exhilarating to the finish between Billy Demong and Austria's Mario Stecher. I love watching this video from The Today Show about aerialist Emily Cook.